Cathy's Card Spot: You're out of this world! Hi everyone, I was so excited when Bonnie recently invited me to be a guest designer at Cas Mix Up Card Challenge! I love CAS cards and I also love trying different mixed media techniques. The video tutorials Loll and Bonnie linked to the site were a great help too, as this is still a pretty new technique to me. 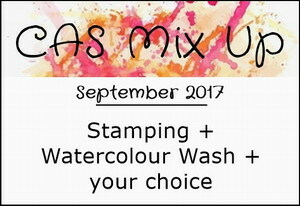 The recipe for this month is to use watercolour washes along with stamping and at least one other component or technique. My extra components are distress inking, wet embossing and diecutting. I started by applying a wash to some watercolour paper using Kuretake Gansai paints. I didn't stop with one though! I added more blues and water and kept the paint moving by tilting the board the paper was taped to. While the flat washes looked ok I actually loved the texture created as the paint pooled and bloomed. I added a spatter of silver Finetec paint to add a starry effect. Next I applied some chipped sapphire and black soot distress ink around the edges. A spray of water helped the inks blend in to the watercoloured area. I stamped one of the Altenew moon images and embossed it with liquid platinum powder. I diecut it with a small circle die, added some grey distress ink and used a mouse pad and shaping tool to add some dimension. It's popped up on a smaller disc of fun foam to keep the 3d look. The stamped sentiment is embossed with fine detail silver powder and I diecut the Dad from a snippet of silver paper. It's Father's Day here on Sunday, so I hope he likes his card! and to the make your mark challenge at Addicted to Stamps & More. Kuretake Gansai and Finetec silver watercolour paint; distress inks; Altenew to the moon stamp; versafine ink and liquid platinum and fine silver embossing powder; Impression Obsession alphabet die. What a stunning sky and moon! Love the rich dark blues of your watercolour wash and the subtle splattering for stars. Your heat embossing and die cut combination for your sentiment is terrific. Thank you for being our Guest Designer this month! The addition of silver paint to your great background is beautiful. Embossing the moon was a terrific idea and really makes it stand out. He will love this card. Fantastic card, he'll love it. Absolutely stunning, the moon just glows against the deep blue background. This card is amazing. Just magic !! I love your night sky and this amazing moon. Wow! Your watercolor wash background is fantastic, Cathy! Love that moon and the added dimension! Thanks so much for joining our Design team this month at CAS Mix Up! Congrats on the GD spot! You created a stunning night sky and moon! Fabulous card! Love the design and that wonderful background! So pretty! Fantastic card! The background is stunning. Thank you for sharing your card with ATSM! Congrats on your win and Guest Designer spot, Cathy! This is such a stunning card! Your watercoloring is beautiful and I love that you embossed the moon in silver...a really striking masculine card!! !